Meadowvale has located more than 75 tanks in the last two years, saving clients over $100,000 in tank removal costs alone. Any soil contamination can add tens of thousands to a single cleanup. You need to know if you have an underground oil tank. Sometimes during contract negotiations there isn’t enough time to fully research a property due to multiple offers coming in. Let us help you and your Realtor move forward quickly. Because we use our own state-of-the-art ground penetrating radar unit, you will know if you need to be concerned about an underground oil storage tank (UST) the same day as the home inspection. Cost: $75 if ordered within 30 days of a home inspection on the same property. Contact us with any questions or special requests. A tank is found and its location is marked. The tank is uncovered and removed. All that’s left is an empty hole, and peace of mind. What are the municipal regulations for underground oil tanks around Victoria, BC? Different municipalities have different regulations regarding oil tanks. You can check what the situation is by visiting the following municipal website pages. If you are looking at a property outside the areas below, call your municipal office for information. If you find a buried oil tank or former tank location can you remove the tank and test the area? Meadowvale Home Inspections does not remove tanks or test the area for contamination. We will be pleased to point you in the direction of reliable companies who are experts in removal and remediation if a tank is found on your property. 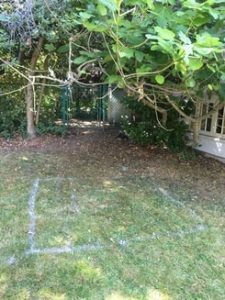 Should I be concerned if a buried oil tank used to be on my property, but was removed? Yes and No. The tank may have leaked prior to removal. If the Seller can provide you with a report documenting the tank was removed and testing was completed, then no, you should be fine. 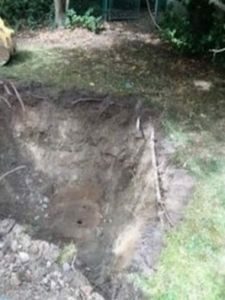 How soon will I know if you found an underground oil tank on my property? The scan can be done at the same time as the home inspection. So you will know if a tank is present when you receive your inspection report. A scan does not delay your report in any way. However if you wish, you can delay the scan for up to 30 days following your home inspection. This allows you to save the cost of the scan if you choose to not present an offer on the house for other reasons. As scan ordered within 30 days of a home inspection costs $75. Stand-alone oil tank scans are no longer available. Contact us with any questions or special requests. A tank was found during my inspection, and the homeowner later removed it himself. How do I know the job was done properly? The BC Ministry of Environment Fact Sheet 32 describes the provincial regulations concerning underground oil storage tanks. It is especially important to be aware of the requirements if the homeowner has chosen to remove the tank himself, rather then having the job done by an experienced contractor. How do you find a tank on my property? Meadowvale inspectors scan the property using ground penetrating radar (GPR) – the most reliable and accurate instrument available for detecting the presence of underground oil storage tanks. Details on how GPR can be used to locate an underground tank can be found in some of the FAQ’s lower on this page. A Magnetic Locator is a device which detects ferrous metals exclusively. It will not detect non-ferrous metals such as aluminum, brass or copper. The benefits of a ferrous metal locator is that it will not register ‘false positives’ caused by non-ferrous metals and will detect ferrous metals to a much greater depth than an all-metal detector. Depending on its mass, the magnetic locator will detect a ferrous metal target to a depth of 30 feet. The detection range is greatly dependent on the mass and orientation of the target ranging from a couple of inches to several feet. Targets are limited to ferromagnetic materials—iron, steel and alloys. An inductive Pipe Locator is a device which passes an alternating electric current to a pipe, creating a magnetic field around the pipe. An electromagnetic sensor above the ground detects the induced magnetic field and allows the operator to track the location and depth of the pipe under the ground. This is particularly helpful when an oil fill line is present, but it can also work by inducing a current even if no direct connection to a pipe is possible. These three pieces of equipment, when used by an experienced operator, enable the inspector to detect and locate underground oil storage tanks with a high degree of accuracy. Am I likely to have an Underground Oil Storage Tank? 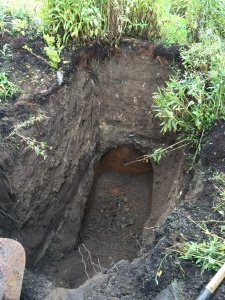 If your Victoria area home was built in the 1960’s or earlier it may have been heated by oil stored in tanks buried in the ground. As many of these homes converted to gas or electric heat instead of oil, these tanks were occasionally left buried in the ground. Sometimes the oil was pumped out and the tank filled with sand and then covered with dirt. Other times, the tank was simply abandoned and remained buried. Underground tanks slowly rust, and with the passing of years, residual oil, even in tanks filled with sand, can begin to leak into the ground. The homeowner is responsible for the cleanup and all associated costs. Are there records of Underground Oil Storage Tanks anywhere? Underground storage tanks may be mentioned in municipal or fire department records. We use our contacts at the municipalities and fire departments to see if they have useful information. This record check is included as part of our underground oil tank scan. Sometime archived Multiple Listings reports mention oil tanks and we attempt to check these as well. Properties where a history of UST removal and certification is not available from the homeowner or municipality should be tested. A Ground Penetrating Radar (GPR) scan helps determine the possibility of buried tanks and can indicate areas where tanks may have been removed. Ground Penetrating Radar refers to the process in which a device radiates short pulses of high-frequency electromagnetic (EM) energy into the ground from a transmitting antenna. When a wave of this EM energy encounters the interface of two different materials (such as an oil tank buried in the ground), a portion of the energy is reflected back to the surface. This reflected energy is detected by a receiver antenna and transmitted to a control unit for processing and display. If the signal does not encounter a buried object the EM signals goes deeper into the ground. The difference between these two readings is what allows us to identify an object buried in the soil. Short video (2:06 minutes) showing how GPR can be used. Using ground penetrating radar will give the most accurate results when searching for underground oil tanks. Other devices, while helpful in a search, all have serious limitations which do not allow them to provide the high degree of certainty possible with GPR. How do you use GPR to scan for a buried tank? The GPR system is mounted on a wheeled cart (about the size of a lawn mower) which is pushed by the GPR operator. As the radar unit is moved over the surface of the ground, scan data is collected and interpreted by the operator. When the operator detects a tank, he marks the location with water soluble marking paint. Tank has been detected and its location has been marked. This image shows the tank still buried in the ground. How deep can GPR penetrate or see below the ground? Maximum penetration is 50 feet or more in dry granular rocks and sediments. The depth of penetration is reduced in harder, undisturbed soils. The top of most USTs are located within the first 8 feet of depth. How can you check under asphalt driveways and concrete patio slabs? Ground penetrating radar can penetrate asphalt and concrete to locate underground oil storage tanks. By regulating the frequency of the GPR antenna, the operator can detect objects such as underground oil tanks at a variety of depths. Is a GPR scan the same thing as an X-Ray scan for underground storage tanks? The terms “Ground Penetrating Radar” and “X-Ray” are sometimes used interchangeably. But they are not the same thing, and do not describe the same process. X-Ray scans cannot be used to locate underground oil tanks, as X-Ray scans require physical access to both the top and bottom of the substance being scanned. The construction industry uses X-Ray scans when examining the concrete slabs in multi-story structures such as apartment buildings and parking garages. However, an X-Ray scan is of no use at all when hunting for underground oil tanks.